At last week’s USGBC EPMA meeting I presented three works by Maryann Thompson Architects. MTA’s portfolio specializes in architecture that is sustainable, regionally driven, and that attempts to heighten the phenomenological qualities of the particular site. These three projects especially demonstrate how environmentally-friendly principles become another layer in the overall human experience. The Walden Pond Visitor Center, built in 2016, is a net-zero consumption building that implements passive solar principles. The wooden structure blends seamlessly into the surrounding landscape while solar panels over the nearby parking lot provide year-round energy. Geothermal House, built in 2006, also shows how passive solar principles can be integrated in contemporary residential design. The activities within the house follow the path of the sun throughout the day, beginning on the East-facing kitchen and concluding on the West terrace. Zero Energy House, also built in 2006, was the first LEED certified single-family residence in Massachusetts. The 3-bedroom, 3-bath, open floor plan home reveals how new construction can be accomplished within a reasonable budget. Sustainability is not necessarily only about energy consumption and material resources, well-designed structures also create a sense of permanence. Whether a single family home or a program open to the public, most buildings are intended to last at least a few generations. Constructing well-loved spaces with a lasting positive experience is an essential consideration in sustainable design. EMD Serono’s Project SagaMORE has received both the 2018 Green Building of the Year and the Market Leader in Health and Wellness Awards from the USGBC Massachusetts. It is a 30,000 SF expansion to EMD’s R&D campus in Billerica. The existing office building and addition have jointly achieved WELL Gold certification for New & Existing Construction from the International Well Building InstituteTM (IWBI). It is the first New & Existing Building WELL Certified Gold project in the US and only the second in the world. In 2015, Project Sagamore renovations transformed an existing manufacturing plant on the campus into 24,000 SF of new office space for 200 researchers. Guided by EMD’s Four C’s of Choice, Comfort, Collaboration, and Challenging the norms, the company aspired to provide a best-in-class workspace to retain and attract industry talent . That project achieved LEED Platinum certification and incorporated many goals of the WELL certification program, which did not exist at the time. Major design features included promoting the use of stairs rather than elevators, natural daylight and outdoor views, ergonomics, and a sense of place. This renovation quickly became the most popular research office space on campus. As a result of the project’s success, and the need for even more office space, Ellenzweig and Intec designed an addition that more than doubles the 2015 office renovation. Named Project SagaMORE, its design challenge was to further improve on the design successes of Project Sagamore while achieving both WELL and LEED certification. As a pharmaceutical company, EMD is committed to health regeneration. That ethos inspired a biophilic design solution that both physically and metaphorically manifests itself in the new addition. As a result, health and wellness features and amenities are found throughout the project. Central to the new facility is the Lobby Commons that sits between the original and new office buildings. It features a prominent “river” of planting that wends its way from the exterior entry plaza into, and through, the space. Alongside that planting, a prominent stepped seating staircase invites walking to the second floor rather than opting for the elevator. A café, alcove and countertop seating, as well as huddle rooms round out the wide variety of collaborative and quiet gathering spaces that surround the commons. All of these spaces are naturally day-lit in combination with circadian rhythm LED lighting. Fundamental to both the lobby commons and other neighborhoods in the building, is visual connection to the outdoor landscape, and access to a wide variety of workspace environments. For instance, people can be extroverted or introverted; some tasks require isolated concentration, others spirited collaboration. As result, SagaMORE includes dedicated open-office sit-stand desks, private hoteling offices, telephone rooms, huddle rooms, conference rooms, banquet booths, quiet rooms, and outdoor workspaces. This humane variety of spaces that focus on well-being has demonstrably increased overall employee engagement. Deeply integrated into the interior, as well as exterior entry elements, is the lively incorporation of EMD’s Merck corporate branding graphics that are based on a visual language of monochromatic cellular shapes and bright accent colors. Complimentary to the biophilic forms of the building, they are incorporated into the walls, portals, and flooring to further reinforce the health regeneration mission of the company. The SagaMORE project incorporates low-VOC emitting interior furnishings and finishes; high-efficiency LED interior lighting that promotes proper circadian rhythms; planters full of natural vegetation. The campus does not provide, or make available, any food or beverages containing Trans Fats or with a high or sugar content (such as soda or junk food) within the facility or its vending machines. The design and construction team for EMD’s Project SagaMORE understood that the products and materials specified and installed would eventually need to pass performance verification to achieve WELL certification. As a result, everyone understood that all planning decisions would influence the project’s potential to become a certified building. To that end, its successful passing of the performance verification was an accomplishment not only for the design team, but also for the occupants. WELL goes beyond designing healthy spaces – it drives building operators to facilitate occupant exercise and behavior. Projects that provide outdoor gardening space and support, or provide alternative commuter facilities (i.e. bike storage and showers) and organizations that incentivize physical activities are just a few of the ways WELL works to improve building occupant health. The implementation of WELL features demonstrate how buildings can, and should improve occupant health. WELL v1 is organized into 7 concepts: Air, Water, Nourishment, Light, Fitness, Comfort, and Mind, and certification is performance based. The SagaMORE project at EMD Serono is currently pending LEED NC certification. It is expected to achieve a Gold rating with 42% water use reduction, 30% energy cost reduction, and 82% reduction in construction waste. Unveiled in 2017, the multi-purpose Bentley Arena was built to serve as the new home to the university’s NCAA Division I hockey team and prominent university events. In 2018, Bentley Arena added a LEED platinum certification, the highest possible rating, from the U.S. Green Building Council to its trophy case. This year Bentley University was also presented with the USGBC Massachusetts Chapter’s Eversource Energy Optimization award during the Green Building Showcase and celebration of sustainable design and construction of buildings across the state. Several projects from the Eversource electric and gas territory were considered, however, the Bentley team rose to the top for meeting the key criteria of a commitment to energy efficiency in an integrated and interdisciplinary fashion from the earliest stages and also having design aspects that are replicable by organizations undertaking similar projects. From the high-efficiency LED lighting and boilers, to the cutting-edge waste heat recovery systems and evaporation equipment, this arena is a national model for energy-efficient construction. The energy efficiency measures will deliver more than $46,000 in annual energy cost savings. The project also included a 504 kilowatt, rooftop solar array and 1,400 rooftop solar panels that will generate 40 percent of the building’s annual electricity needs. And, a strong benefit of the new facility that shouldn’t be overlooked, students are able to use of the arena as a “living lab” where they will be able to analyze the building’s energy data, complete marketing projects, create sales plans for season tickets, and do other academic projects. Well, GBS ’18 was sure a blast! We had an amazing time at GBS ’18. 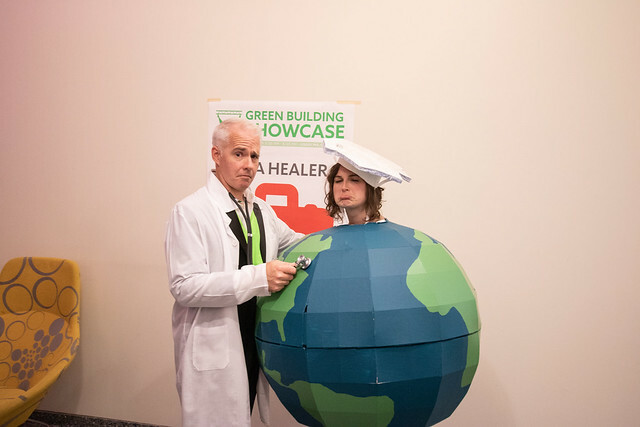 From Jim Stanislaski’s and Aminah Mcnulty’s breakout performances in the opening “Mother Earth” performance to EMD Serono winning Green Building of the Year, there were some memorable moments. This event would not have been possible without support from all of our sponsors, judges, and our wonderful community. From the beginning, USGBC MA has been a team effort, and we firmly believe it’s your community. Check out event photos below, as well as short bios on each of the winners of the night. We hope to see you next year! It includes low-VOC emitting interior furnishings and finishes; high-efficiency LED and WELL-compliant interior lighting; planters full of natural vegetation indoors, and a strong visual connection to the outdoors. Project SagaMORE is a 30,000 SF expansion of EMD Serono’s R&D campus in Billerica and was designed to enhance EMD’s progressive work culture through employee engagement, wellbeing, technology, and biophilic design. The project’s design challenge was to expand and improve upon the existing, 24,000 SF office building (Project Bridgeway) to produce a unified solution, while achieving both WELL and LEED NC certification. Both the existing office (Project Bridgeway) and annex (Project Sagamore) have jointly achieved WELL Gold certification for New & Existing Construction from the International Well Building InstituteTM (IWBI)TM. It is the 1st New & Existing Building WELL Certified Gold project in the US and only the 2 in the World. The EMD project design promotes the use of stairs rather than elevators. It includes low-VOC emitting interior furnishings and finishes; high-efficiency LED and WELL-compliant interior lighting; planters full of natural vegetation indoors, and a strong visual connection to the outdoors. EMD does not provide any food or beverages containing trans. fats or a high sugar content (such as soda or junk food) within the facility or on campus, including vending machines. The facility passed the circadian lighting and IAQ performance tests required for WELL certification. The design and construction team understood that every decision bore a definitive impact on the project’s ability to become a WELL certified building. In this regard, the project’s successful passing of the performance verification was an accomplishment not only for the design team, but also for the occupants – who moved into a space that was officially verified to have a healthy indoor environment. Project Sagamore is currently pending LEED NC v2009 Gold certification. It is expected to achieve a 42% water use reduction, 30% energy cost reduction, and 82% reduction in construction waste. Project Bridgeway previously achieved LEED CI v2009 Platinum Certification. Everyone wants a home of their own. The building design optimizes comfort, durability, and energy-efficiency by adopting the PHIUS+ 2015 Passive House standard specific to Atlanta’s climate. This project imagines a 21st-century single-occupancy community by integrating a diverse and growing cross-section of the population that for a variety of reasons live alone; one that is equally attractive to those with few options to leave and those who can choose to live elsewhere. The design is organized around different scales of open spaces that mediate the threshold between the privacy of the home and shared public realm. The Porch and Stoop units have shared, flexible “front yards” which support a range of uses from occupant-tended gardens to parking, and “backyards” which offer privacy and greener views to the constructed wetland on site. They allow unhindered pedestrian movement throughout acting as an extension of the semi-public realm. Building design optimizes comfort, durability, and energy-efficiency by adopting the PHIUS+ 2015 Passive House standard specific to Atlanta’s climate. Buildings will be better adapted to climate change, be net-zero ready, and achieve significant energy savings. Community facilities do not rely on the municipal power grid during outages and emergency events, thus doubling up as spaces of refuge and allowing critical community services to stay fully operational in times of need. The site design creates a responsible precedent for future development along emerging transit corridors by prioritizing sustainable transportation modes in an auto-dominant Atlanta. It accommodates a BRT stop on Metropolitan Ave servicing the proposed BRT connecting downtown to the airport. Community functions located at the project’s front-door provide amenities for the neighborhood, beyond the residents our project. The distinct programs and forms of each typological space allow for diverse experiences on the river ranging from dining opportunities to expansive public event programming to new amenities for human-powered craft. In 2012, Sasaki, Ross Barney Architects, Alfred Benesch Engineers, Jacobs/Ryan Associates, and a broader technical consultant team, was tasked with creating a vision for the six blocks between State Street and Lake Street. Building off the previous studies of the river, the team’s plans provide a pedestrian connection along the river between the lake and the river’s confluence. The task at hand was technically challenging. The design team, for instance, needed to work within a tight permit-mandated 25-foot-wide build-out area to expand the pedestrian program spaces and negotiate a series of under-bridge connections between blocks. Further, the design had to account for the river’s annual flood dynamics of nearly seven vertical feet. Turning these challenges into opportunities, the team imagined new ways of thinking about this linear park. Rather than a path composed of 90-degree turns, the path was envisioned as a more independent system—one that, through changes in its shape and form, would drive a series of new programmatic connections to the river. With new connections that enrich and diversify life along the river, each block takes on the form and program of a different river-based typology. As a new connected path system, the Chicago Riverwalk design provides both continuity and variety for a park visitor. The distinct programs and forms of each typological space allow for diverse experiences on the river ranging from dining opportunities to expansive public event programming to new amenities for human-powered craft. At the same time, design materials, details, and repeated forms provide visual cohesion along the entire length of the project. Paving, for instance, mirrors the contrasts of the existing context: A refined cut stone follows the elegant Beaux-Arts Wacker viaduct and bridgehouse architecture, while a more rugged precast plank flanks the lower elevations and underside of the exposed steel bridges. Project SagaMORE is currently pending LEED NC v2009 Gold certification. It is expected to achieve a 42% water use reduction, 30% energy cost reduction, and 82% reduction in construction waste. Project SagaMORE is a 30,000 SF expansion of EMD Serono’s R&D campus in Billerica and was designed to enhance EMD’s progressive work culture through employee engagement, wellbeing, technology, and biophilic design. The project’s design challenge was to expand and improve upon the existing, 24,000 SF office building (Project Bridgeway) to produce a unified solution, while achieving both WELL and LEED NC certification. Both the existing office (Project Bridgeway) and annex (Project SagaMORE) have jointly achieved WELL Gold certification for New & Existing Construction from the International Well Building Institute (IWBI). It is the 1st New & Existing Building WELL Certified Gold project in the US and only the 2 in the World. The EMD project design promotes the use of stairs rather than elevators. It includes low-VOC emitting interior furnishings and finishes; high-efficiency LED and WELL-compliant interior lighting; planters full of natural vegetation indoors, and a strong visual connection to the outdoors. EMD provides occupants with WELL compliant food service. It does not provide any food or beverages, within the facility or its campus, that contain trans. fats or that have a high sugar content (such as soda or junk food) in excess of the WELL standard’s requirements. The facility passed the circadian lighting and IAQ performance tests required for WELL certification. The design and construction team understood that every decision bore a definitive impact on the project’s ability to become a WELL certified building. In this regard, the project’s successful passing of the performance verification was an accomplishment not only for the design team, but also for the occupants – who moved into a space that was officially verified to have a healthy indoor environment. The office building structure includes innovative Cross Laminated Timbers; the first of its kind in New England. Designed as a three-story office space, this 16-acre site reverses the conventional, inwardly focused commercial building by implementing a flexible floor plan and indoor/outdoor program that advances human health and wellness. The office building structure includes innovative Cross Laminated Timbers; the first of its kind in New England. Lumber cut from the site is harvested and brought to local sawmills to create the material for the CLT structural panels which have lower embodied carbon than traditional steel construction. Structural wood bays provide tenants an open floor plan with large, uninterrupted views to the outdoors. Tenants are brought together at the ground level to a full cafeteria that faces a large lawn space with outdoor seating. The site features a central courtyard which helps elevate the building access points above the FEMA floodplains and gently slopes down towards the waterfront using native plantings and rain gardens to help control the on-site storm water. Located in East Boston, this new multi-family residential development faces many challenges as a waterfront site already affected by the rising coastal tides surrounding the Boston Harbor. The project focuses on resiliency planning and Chapter 91 public spaces for the growing neighborhood showing how both requirements can be designed to benefit each other. In addition to the 19 residential units, the site features a central courtyard which helps elevate the building access points above the FEMA floodplains and gently slopes down towards the waterfront using native plantings and rain gardens to help control the on-site storm water. Amenities include a dry flood proofed underground parking garage, access to the “urban beach,” and public kayak storage. An independent townhouse to the residential side of the site helps bridge the small-scale residential street language into the larger and modernly detailed development abutting large public spaces of the beach and parkway. A parametric model was developed alongside custom compositing software to allow the team to perform iterative simulations accurately predicting solar performance of the screen, optimizing the profile, form and performance of the sunshade system. Constructed on an urban brownfield site consisting of an existing surface parking lot set between two garages, the ISEC represents the completion of the first phase of the newly planned 660,000 SF academic precinct. Dynamic movement systems permeate the project, expand a campus and bridge two Boston neighborhoods. This cutting-edge research facility defines a new academic and social hub for students and allows Northeastern University to compete as a premier research institution. Aggressive targets and an integrated approach to sustainability were embedded in the project from the planning stages throughout the design process, impacting everything from the programmatic organization of the building to the design of the building enclosure, including its signature “solar veil.” A parametric model was developed alongside custom compositing software to allow the team to perform iterative simulations accurately predicting solar performance of the screen, optimizing the profile, form and performance of the sunshade system. This workflow was used to tune the system performance feeding directly into the building energy model, allowing the engineers to correctly size equipment, which provided 33% energy savings over code. The Bentley Arena not only enhances student life on campus, but serves as a “living laboratory” connecting the classroom to the built environment. Bentley University’s new state-of-the-art multipurpose arena, this facility is home to Bentley’s NCAA Division I men’s hockey team and the setting for university events such as career fairs, concerts, high-profile speakers and alumni gatherings. The venue, designed by Architectural Resources Cambridge and built by Suﬀolk Construction, marks Bentley’s rise as a modern, nationally-recognized business university. The Bentley Arena not only enhances student life on campus, but serves as a “living laboratory” connecting the classroom to the built environment. Students studying business and sustainability are analyzing the arena’s energy usage data and the impact of the rooftop solar array on the university’s greenhouse gas emissions and operating budget; students studying media technology operate the video control room; and marketing students are engaged in graphic design development for the arena’s jumbo-tron. The LEED Platinum certified building boasts a 500KW rooftop solar array which provides the standalone ice arena with 40% of its annual electricity needs. A state-of-the art heat reclamation loop captures waste heat from the ice making equipment and uses it in domestic hot water and space heating systems throughout the building. LED lighting is present throughout the building and a large amount of window glazing allows much more natural light into the space than is typically seen in arenas. The combination of energy efficient technology and onsite renewable energy has resulted in the Bentley arena emitting 50% fewer climate-change causing greenhouse gases per year as compared to similar ice arenas. Arena visitors enjoy views to the outside from all of the public areas in the building and a specially cut window on the building’s west side provides a view to the adjacent wetlands. This special window is accompanied by a sign educating building visitors on the importance of the wetland area both as a natural habitat and in stormwater management for Bentley’s campus. Low-flow plumbing fixtures and waterless urinals reduce the buildings plumbing water use by 48%. Native and adaptive plant species including a meadow planted with local wildflower species on the north side of building eliminate the need for irrigation. The Bentley Arena is a sustainable investment in the future of Bentley, providing a gathering place to welcome the entire Bentley community for many years to come and enhancing the place-based student experience that is the hallmark of a Bentley education. As we approach our Green Building Showcase on the 25th, we will be releasing a series of project spotlights that will be shown at the event! Check out three from Gensler, Elkus Manfredi, and HDR. Don’t forget to buy a ticket or register your board for the event! Energy consumption is expected to be 51% lower than comparable buildings in the region, and the campus is the first New England building certified as LEED Gold V4 BD+C. Partners HealthCare approached its administrative campus as an opportunity to transform a brownfield site in an urban, mixed-use development into a healthy and environmentally-responsible campus that reflected its values as a healthcare industry leader. Each aspect of the design was carefully considered for its impact on employees, the community, and the environment. The resulting campus embodies Partners’ commitment to holistic wellness. Floor-to-ceiling windows deliver abundant natural light and offer views of a thoughtful landscape design that incorporates native planting and manages rainwater retention. Spacious staircases and sit-to-stand workstations encourage employee movement. Expansive roof terraces and accessible balconies provide easy access to fresh air, and the full-service cafeteria offers a wide variety of healthy choices. The campus’ energy performance was also a priority for the project team. Energy consumption is expected to be 51% lower than comparable buildings in the region, and the campus is the first New England building certified as LEED Gold V4 BD+C. A 0.64-acre green roof absorbs water and lowers heat absorption. Atop the garage, an approximately 2-acre solar array offsets 40% of peak campus demand. To address long-term resiliency, the project team elevated the flood zone site by three feet and placed critical equipment on the roof. In addition, this site was selected for its connectivity and access to public transportation. The campus entrance is less than 500 feet from an MBTA subway station, providing an easy link for employees and visitors. Bicycling is encouraged through on-site locker rooms and showers, parking for over 150 bicycles, and an easy connection to a nearby bike path network. The campus design also includes generous public outdoor spaces that further contribute to the community’s green space network. Siena joins Sepia as the next condominium project at Ink Block in the South End neighborhood of Boston. Siena is a collection of 76 new, luxury condominiums at the six-building, superbly located, urban mixed-use development. Siena combines high-style architecture and design with luxury amenities and access to a Whole Foods Market, restaurants, and shops. Siena’s exterior architecture is inspired by Italy’s famous Duomo di Siena – the cathedral of Siena – which is marked by alternating horizontal white and green-black marble stripes. Interior common areas include a fitness center, library lounge, minibar, communal dining table, catering kitchen, lounge with fireplace, bike room, and sky lounge. The sky lounge includes an indoor area with a fireplace and a bar with a pass-through window to the exterior roof terrace, which in the warmer months offers additional seating, a firepit, and a grill station. All six completed buildings at Ink Block have achieved LEED Gold status, and include more than 50 percent underground parking, bike racks for 15 percent of the residents, water-efficient landscaping, and low-flow fixtures. More than 75 percent of the construction waste was diverted from disposal and employed regionally sourced and green construction materials such as recycled structural steel, gypsum board, low-VOC paint, adhesives, and flooring. The design intent for the two buildings is a contemporary interpretation of the established maritime “head-house and tail” vernacular. Uniquely situated within Boston’s Marine Industrial Park, iSQ (Innovation Square) has emerged as the avant-garde micro life science cluster, a natural first choice to Cambridge’s saturated bio-pharmaceutical market. Combining contemporary design with planning to promote operational efficiencies, the project aims to attract global entrepreneurial companies with the goal of enhancing productivity, promoting collaboration and enabling transformational discoveries. HDR helped develop the master plan for iSQ and is responsible for the shell and core design of both Phase 1 and Phase 2. The design intent for the two buildings is a contemporary interpretation of the established maritime “head-house and tail” vernacular. The new “head-house” has a chiseled glass expression where the C-suite resides, symbolizing the commitment to cultural transparency and the exchange of ideas. The “tail” has a highly articulated pre-cast concrete expression where lab research occurs. In response to the vulnerability of the site to flooding due to increased rainfall events and storm surge, the ground floor elevation was raised 2’ above the current FEMA 100 year storm flood projections. The electric switchgear was raised an additional 1’ and the majority of mechanical and electrical systems were placed in the rooftop penthouse. Phase 1 is designed to achieve a minimum of LEED Silver certification. It incorporates a number of strategies to reduce energy and water use, reduce transportation emissions in accessing the site, manage stormwater, and create an environmentally responsible and healthy environment through conscientious materials selection. Construction completion of the Core and Shell is anticipated in February 2019. As we approach our Green Building Showcase on the 25th, we will be releasing a series of project spotlights that will be shown at the event! Check out two from our friends at HMFH, and Goody Clancy. The 225,000 GSF, LEED Gold-certified Integrated Sciences Complex brings together all university departments involved in laboratory research in a dynamic, new environment for teaching and research. It raises the bar for the design of a sustainable laboratory, and sets a new precedent at UMass Boston for integrating architecture and landscape. The existing circa-1974 campus buildings are elevated on a concrete parking podium, separated from both the natural ground-plane and the water’s edge. By contrast, the ISC embraces its waterfront site and restores a former brownfield (the entire campus is built on a former landfill) to a natural harbor island habitat. Two plazas on either side of the building’s atrium connect activity indoors and out. An outdoor amphitheater allows teaching to occur out in the landscape adjacent to the physics labs, while a Science Walk now leads from the Boston Harborwalk at the water’s edge through the project site to the campus plaza. A meadow and constructed sand dunes deploy indigenous plant species requiring little or no irrigation. These site elements become educational opportunities, as the pedestrian pathways in the meadow form a Botanical Walk with plaques highlighting the geology and botany of the site. During the late 19th century, a stately two-family home was erected at 859 Massachusetts Avenue in Cambridge. The handsome building was subsequently converted into offices and, unfortunately, stripped of its period detail. Things began to look up again when the City of Cambridge purchased the property and engaged HMFH Architects to restore the dilapidated building and convert it into emergency housing for up to 30 occupants. As part of this conversion, the building systems and exterior envelope were completely rebuilt to meet the City’s new guidelines for net-zero construction, and the architects worked with the Historical Commission to recreate the original exterior detailing and materials as closely as possible.